Landcrafted Food beef sticks are made from grass-fed, open-pasture beef cattle that aren’t given hormones or antibiotics. Building a car means putting thousands of pieces together to create one thing that is sold to one buyer. Selling beef means taking one thing you’ve spent two years raising, cutting it into many pieces and selling them to many buyers. The beef cuts and the buyers don’t always match up. So, Landcrafted Food beef sticks were born. Ivy says the goal isn’t to compete with national meat-stick manufacturers but to help Appalachian cattle farmers like him and his neighbors get more money for their beef and help family farms survive. Ivey and Gary Mitchell are Landcrafted Food’s managing partners. They’re also Grayson County farmers who raise grass-fed, open-pasture beef cattle that aren’t given hormones or antibiotics. They’ve been selling beef for years, but that mismatch of customers and cuts of meat has been a persistent problem. So, they built a smokehouse and processing facility in the town of Independence, hired 10 local workers and set out to sell meat sticks made from surplus cuts. 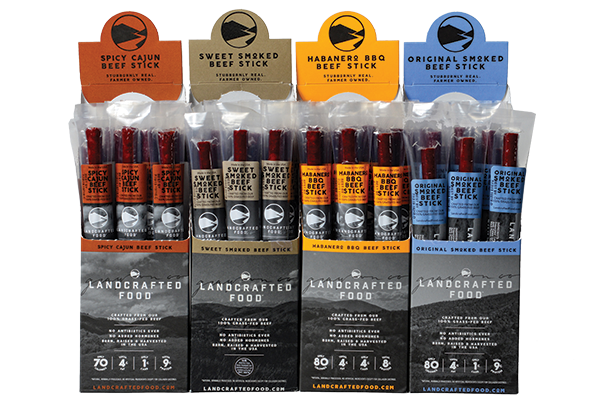 Landcrafted Food, nonetheless, has found buyers for its meat sticks. Many of the stores that sell the partners’ fresh meat, marketed as Grayson Natural Farms, also sell their meat sticks. The products also are found in Virginia Food Lion stores and at Virginia Tech, the University of Virginia and George Mason University. The company has limited distribution across the country and sells on Amazon. The partners keep in touch with every piece of the operation. That surprised one customer who bought a meat stick in Staunton and called Landcrafted Food to check out the company. The call went to Mitchell’s cell phone.